I was at a dinner party with friends the other night and I said I would contribute dessert. 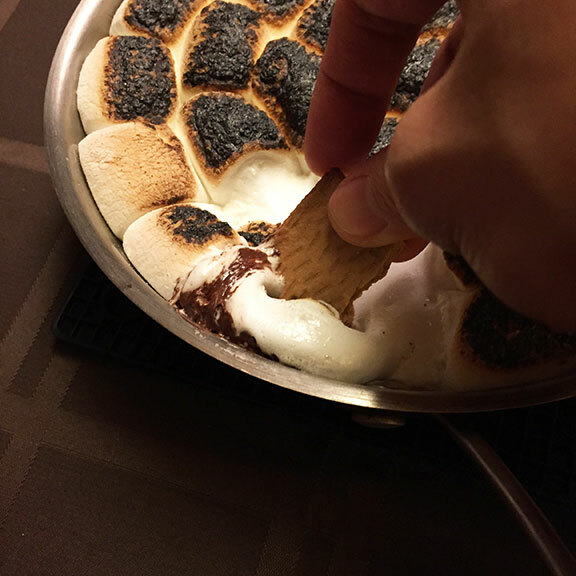 It was the perfect opportunity to experiment on them a food hack I had seen on the interwebs recently for oven baked S’mores. It’s so easy but the results can make anyone look like a pro. All you need is a small 8 to 9 inch cast iron pan. A small one wasn’t available at that time I made this so I used a heavy bottomed stainless steel skillet. This is important as we want to retain as much heat after baking. Obviously the receptacle has to be oven proof as well. So I just dumped a whole bag of Hershey’s semi-sweet chocolate chips in the pan. Distribute evenly. I really like nutmeg so I shaved some on there with a microplane and then sprinkled coarse sea salt. (A similar tweak I did with pan con chocolate.) At this stage you can pretty much put anything you like, such as dollops of peanut butter, sour cherry compote or chili flakes. But simple is good enough already. 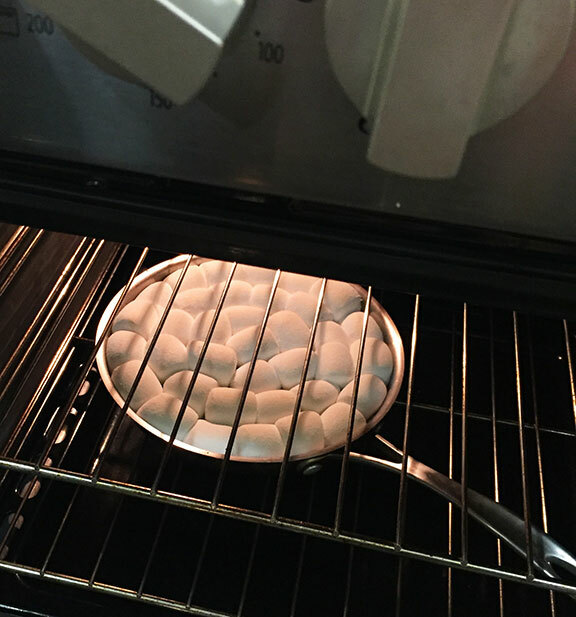 Cover the chocolate chip base with marshmallows. Better to start layering from the outer edges of the pan going in. Throw the whole thing in a preheated 450°F oven or oven toaster for about 8 to 10 minutes. It should look evenly golden brown on top when you pull it out. And this should be good already. 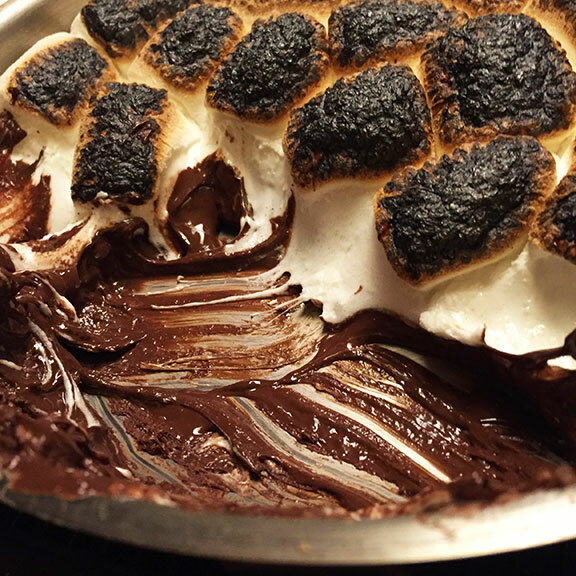 But you know, S’mores aren’t the same without the burnt bits so I get a blowtortch and go over the top for a charred effect. 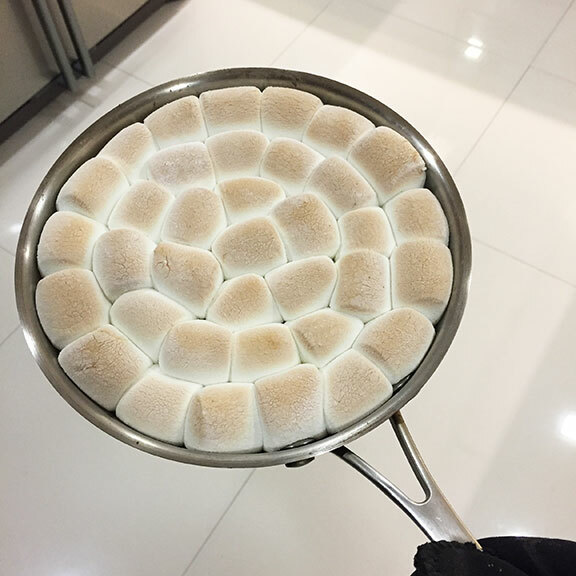 The marshmallows burst into flames at some point. I should practice more restraint but torching things is fun. I guess that just makes things even more authentic, though. Get some graham crackers to use as scoops and then dive into it. Makes for a great interactive party dessert dish. And less fussier than fondues. Warm, toasty, gooey. Tooth-achingly sweet.